Imagine a world where every one of the billions of lightbulbs in use today is a wireless hotspot delivering connectivity at speeds that can only be dreamed of with Wi-Fi. That’s the goal of the man who invented such a technology, and this week Li-Fi took a step out of the domain of science fiction. Yes scientists have just field-tested the new wireless technology called Li-Fi for the first time and achieved marvelous wireless speeds that are 100 times faster than current WiFi speeds. It was tested this week by Estonian start-up Velmenni, in Tallinn.Velmenni used a Li-Fi-enabled light bulb to transmit data at speeds of 1Gbps. Laboratory tests have shown theoretical speeds of up to 224Gbps. All it requires a light source, such as a standard LED bulb, an internet connection and a photo detector. 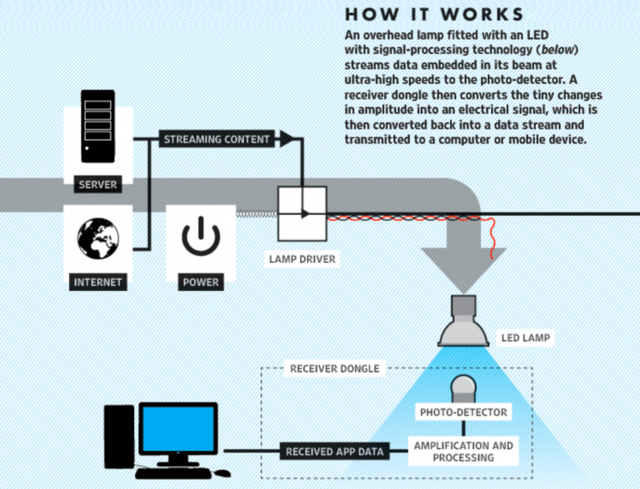 What Is Li-Fi Technology And How Does It Works? Li-Fi is an alternative name for superfast future Wi-Fi. The term Li-Fi was first coined by Prof Harald Hass a professor of mobile communications at the University of Edinburgh, who demonstrated the technology at a Ted (Technology, Entertainment and Design) conference in 2011. His talk, which has now been watched nearly two million times, showed an LED lamp streaming video. Prof Hass described a future when billions of light bulbs could become wireless hotspots. A year after his TED Talk, though, Haas, , created pureLiFi with a group of people who had been researching the technology since 2008. The company has claimed to be the “recognized leaders in Li-Fi technology” and has already produced two products. On Wednesday, pureLiFi announced a partnership in which a French industrial-lighting company will roll out the firm’s VLC technology in its products by the third quarter of 2016. Now how does Li-Fi works? When a constant current is applied to an LED [light-emitting-diode] lightbulb, a constant stream of photons are emitted from the bulb which is observed as visible light. If the current is varied slowly, the output intensity of the light dims up and down. Because LED bulbs are semiconductor devices, the current, and hence the optical output, can be modulated at extremely high speeds which can be detected by a photodetector device and converted back to electrical current. The intensity modulation is imperceptible to the human eye, and thus communication is just as seamless as RF [radio frequency technology]. Using this technique, high-speed information can be transmitted from an LED lightbulb. Haas said during his Ted Talk in 2011 that the current infrastructure would allow every single LED lightbulb to be transformed into an ultrafast wireless router. 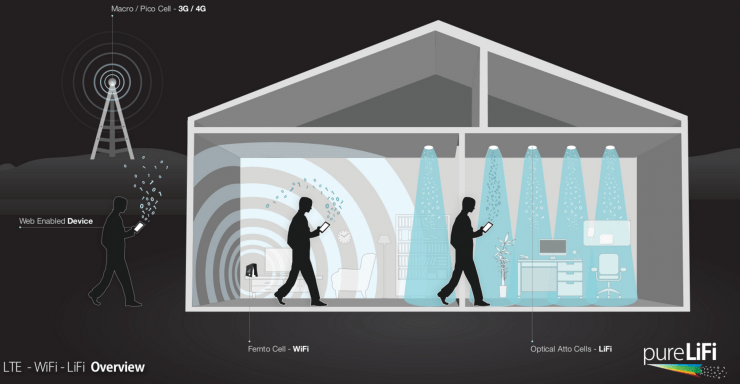 Because Li-Fi technology uses visible light as its means of communication, it won’t work through walls. This means that to have a Li-Fi network throughout your house, you will need these lightbulbs in every room (and maybe even the fridge) to have seamless connectivity. Li-Fi does not work outdoors, meaning that public Li-Fi will not be able to replace public Wi-Fi networks any time soon. While Li-Fi’s employment in direct sunlight won’t be possible, pureLiFi said that through the use of filters the technology can be used indoors even when sunlight is present. Of course, one of the biggest drawbacks is the fact the light needs to be on all the time to deliver connectivity. While that’s not going to be an issue in industrial and retail environments, it’s will be both environmentally and practically problematic in domestic settings. Deepak Solanki, CEO of Velmenni told to IBTimes UK that Li-Fi technology could reach consumers in three to four years.